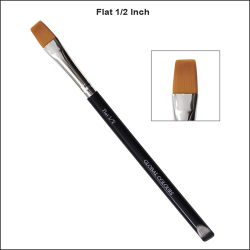 Designed to work perfectly with Global’s popular Fun Strokes, the 1/2 inch flat has the ideal level of resistance to load quickly and provide unparalleled control over your one stroke designs. 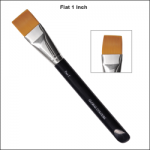 The 1/2 inch flat brush will pick up half of the colours in a Fun Stroke palette at once. This gives you the ability to use just certain selected colours within your Fun Stroke, but also more importantly to use in conjunction with your 1 Inch Flat to provide variety and perspective within your design. Eg. Use your 1 inch brush for your petals, and a ½ inch brush for your leaves. Flat brushes are also ideal for lettering and getting into right angles.